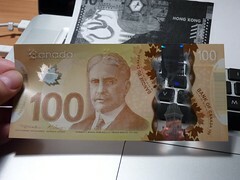 In a followup interview with Nish Vairavanathan, a Bank of Canada currency analyst, this reporter has confirmed that (as far as Vairavanathan was aware) there is only one known case of counterfeit new polymer $100 banknote. 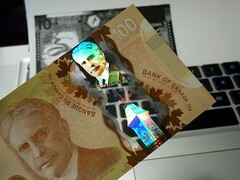 (Note: The new polymer $100 was launched a few months ago in November 2011.) 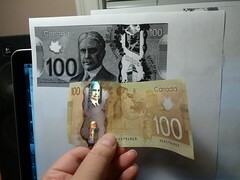 As reported yesterday (also mirrored in an article here), the counterfeit new polymer $100 bill was of very poor quality. 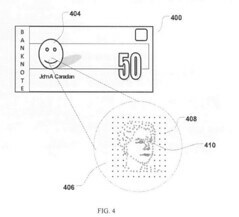 For example, the counterfeit new polymer $100 bill did not have the transparent window in the middle of the banknote, one of the most obvious and easily verifiable security feature. Readers of this article should not be alarmed by the existence of this one known case of counterfeit new polymer $100 banknote, what you can do is arm yourself with the knowledge of the new polymer banknote’s security features. 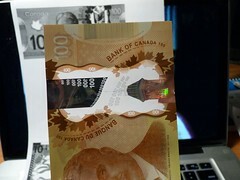 You can start by watching a video of me handling and inspecting a new $100 banknote for its security features up close. 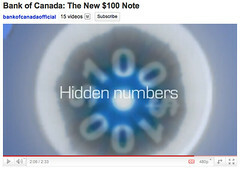 Also watch this informative PSA video from Bank of Canada: The New $100 Note. I’ve been informed the single counterfeit new polymer $100 banknote is with the RCMP National Anti-Counterfeit Bureau being analyzed. I asked if a picture of it is available to the media but was told that information like how it looks, where it was found, etc are not being shared (I presume for security or police investigation reasons). What should Canadians do when we come across suspected counterfeit banknotes? 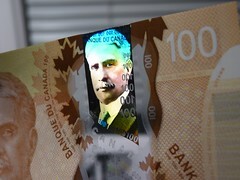 Any Canadians handling cash, especially those in the front line handling cash as a cashier or merchant, etc, should familiarize ourselves with the new polymer banknotes’ security features. When we see any cash that doesn’t look real, then we can and should refuse it and simply politely ask for another form of payment. For our safety, don’t confront the payer as it may put ourselves in danger, contact local police instead. 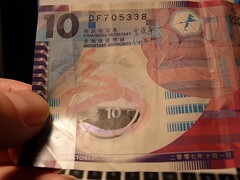 Plus the person with the “counterfeit-looking” banknote may be truly innocent and not aware the banknote is potentially a counterfeit. You may be interested to know, Bank of Canada discovered $2.6 million dollars worth of Canadian Journey series counterfeit banknotes last year, 48% are $20 bills and 37% are $100 bills. 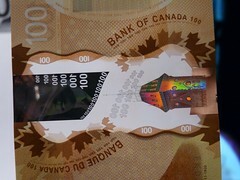 Curious readers may be interested to know, the old Canadian Journey series banknote costs 10 cents each to print compare to the new polymer banknote costing 19 cents each to print but will last 2.5 times longer make the polymer banknotes more cost effective in the long term according to Bank of Canada. 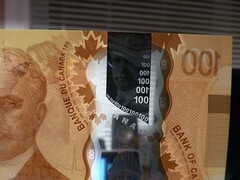 Note: This news is marked “Exclusive” because at press time, as far as I can find or search, no news media has reported or picked on the existence of the one poor-quality counterfeit new polymer $100 note and the fact that the RCMP National Anti-Counterfeit Bureau has it under analysis. Yesterday, Bank of Canada unveiled four public service announcements (PSAs) at Toronto Police Service headquarters. During the post-press conference Q&A, Bank of Canada representative confirmed with this reporter that since the launch of the new polymer $100 notes in November 2011, there have been attempts to counterfeit the polymer $100 notes and the counterfeit $100s were in circulation. Fortunately, according to the Bank representative, the quality of these counterfeit C$100 notes were of very poor quality, for example, these counterfeit notes didn’t even have the transparent windows, one of the most obvious and easily verifiable security features. Which is why the Bank is emphasizing the importance of educating the public to detect counterfeit polymer notes. You can watch my questions and the Bank representative’s answers at the 20:00 mark of this YouTube video. A good way to check bank notes is FLP (Feel, Look, and Flip) as explained here at the 3:20 mark. 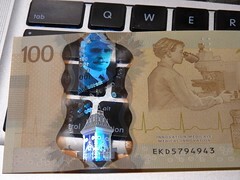 Some readers may remember I’ve previously written about polymer banknotes since Bank of Canada first announced (in March 2011) that it would launch polymer notes in Canada. The following are my in-depth research articles based on information known or found at the time. Note: See also this 660 News article reporting about the BoC press conference, “Bank of Canada launches fraud prevention campaign“. Well “… not in a position to release that information …”, really? I can appreciate the “coolness” in seeing interesting apps and use cases, but security has to be the foundation of MintChip and other similar products, without a properly reviewed, fully inspected, time-tested cryptographic system as a solid foundation, the rest of the “cool apps” & interesting use cases will not be of use to anyone. “The problem with bad security is that it looks just like good security. You can’t tell the difference by looking at the finished product. Both make the same security claims; both have the same functionality. Both might even use the same algorithms: triple-DES, 1024-bit RSA, etc. Both might use the same protocols, implement the same standards, and have been endorsed by the same industry groups. Yet one is secure and the other is insecure. What are in these “prototypes”? How are they tested and verified? 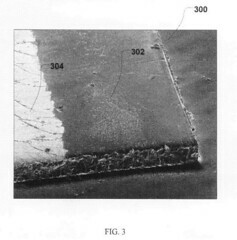 How much of the crypto system are kept in these pending patents and how much will remain part of the “trade secrets”? Security through obscurity is a very bad idea. Of course, in the minds of RCM, they may think the $52,000+ MintChip Challenge prize money is totally worthwhile in exchange of the hundreds of developers’ time and effort. 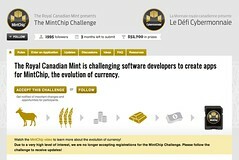 At the same time, if project MintChip fail due to flawed security in the crypto system, the credibility of Royal Canadian Mint will unfortunately be tarnished. So the price is the $52K and the Mint’s reputation! I urge the Royal Canadian Mint to publish the technical details of the MintChip cryptographic system and invite the security community to properly review and inspect the whole system to ensure it has a solid foundation to avoid wasting people’s time and, more importantly, maintain the Mint‘s hard earned credibility. Update: Part 2/2 Privacy Issues, USA Patriot Act, FOIP Act has now been posted. Yesterday, City of Edmonton announced it “will become the first major municipal government in Canada to use Google email and other office technology apps for all City employees“. Google Enterprise stated, “While Edmonton may be the first city in Canada to go Google, it’s in great company with other city governments in North America ─ like Pittsburgh, Orlando and Zapopan, Mexico ─ that have already made the move.” It is only natural for people in Calgary, Toronto, and other cities to ask and find out if there are anything we can learn from Edmonton? In fact, Moore told me a few hundred employees are already in pilot projects using Google Apps. (note: While the police services will stay on their separate system, the city’s fire services, parks & recreations, waste management/day-to-day garbage pickup, tax department, etc are part of this move.) 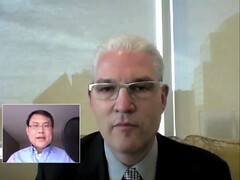 In a phone interview with Dr. Jonathan Schaeffer, University of Alberta Vice Provost and Associate Vice President (Information Technology) responsible for moving the university to Google Apps for Education, he said U of A has successfully transition 125,000 people and have 3,000 people to go in a phased migration. The U of A project started in March 2011 and is expected to be completed in early fall 2012. By going to a cloud-based solution, Moore explained the city is moving away from the old model of software licenses installed on desktops and laptops, with upgrades every year or every other year, to the concept of iterative changes which people have already experiencing in their use of technologies at home. 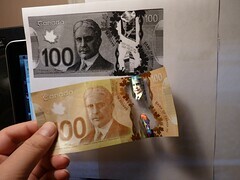 After a detail (with video) and more serious look at the new Canada polymer $100 banknote, I decided to have some fun and put the brand new $100 to a money “laundering” test. I washed & dried it in a dryer to see what happen. * The fold marks are not much worst than regular use. * The polymer $100 feels noticeably softer after heated up in drier but it feels ok and strong. * The metallic strip and the holograms are still working great. * If you accidentally leave your $100 bills in your jeans pocket, they will survive a wash and dry cycle easily!